Patricia Ballentine is known to many as an integrated artist having accomplished some degree of blending the right and left brain in her creative expressions. 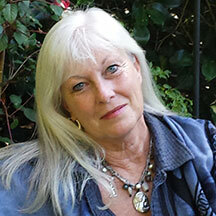 With an engineering background and over 40 years of experience as an industrial designer, she is also a visual artist, a poet and author, a process facilitator and teacher, an ordained minister and Priestess. A practitioner of the deepest magic, which is the transformation of Self, her focus is on the expansion of beauty, integration, unity and wholeness. Her spiritual life focuses on the ancient wheel of the year and Nature is her church.